At first sight, Dulltown doesn’t appear to be exactly steeped in history. It’s not like Bath or York or Canterbury, or places like that that have heritage oozing out of every pore. You’d have to wait a long time if you stood in Dulltown High Street waiting for the open-topped tourist bus to come along. 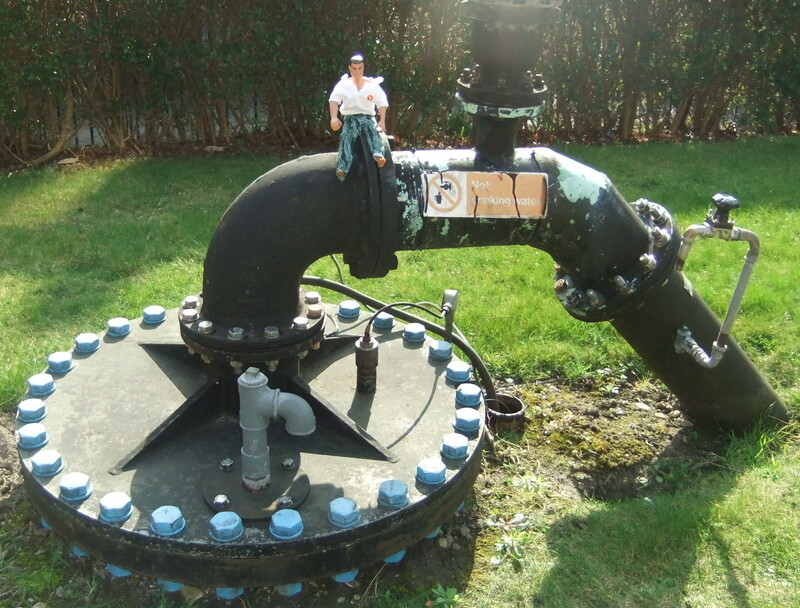 Fun in the sun: Action Man enjoying his day out at the well-head of the former pumping station. So it was news to me, when I happened to stumble across the local guidebook in the library, that there was a Dulltown “Heritage Trail”. I wasn’t alone. When I asked if anyone from the office wanted to join me on the trail, the response was along the lines of “I didn’t know Dulltown had any heritage”. Sceptical and amused in equal measure was their reaction. Consequently I had two immediate customers signing up for some heritage action, and several others promised to come along another time if it turned out to be a lunchbreak offering more interest than their usual trip to the pub or the charity shops. 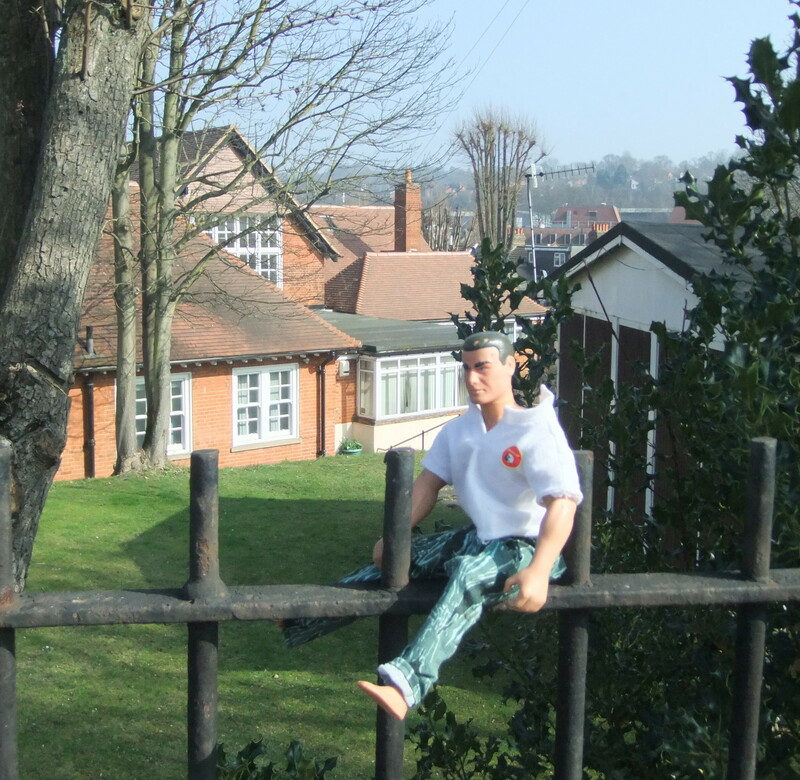 Meanwhile, I’d had several requests for more of the childish Action Man photos that appeared in an earlier post (see https://fwords.co.uk/2012/02/29/25-things-to-do-in-a-dull-town-at-lunchtime-1-find-nice-and-useful-things-to-buy-in-charity-shops/), so it seemed a good opportunity to kill two birds with one stone by taking an Action Man out on the Heritage Trail. So, the four of us set off, complete with cameras and guidebook, to follow the trail and see what we could learn about Dulltown’s hidden history. The first sight of special interest was the well-head on the site of a former pumping station, built in olden days to control flooding of the town centre by the river. Contemporary opinion is divided as to whether letting it flood might not have been the best thing all round, but there’s no accounting for taste. “Architectural landmark”: Dulltown’s Post Office. Can you spot Action Man? 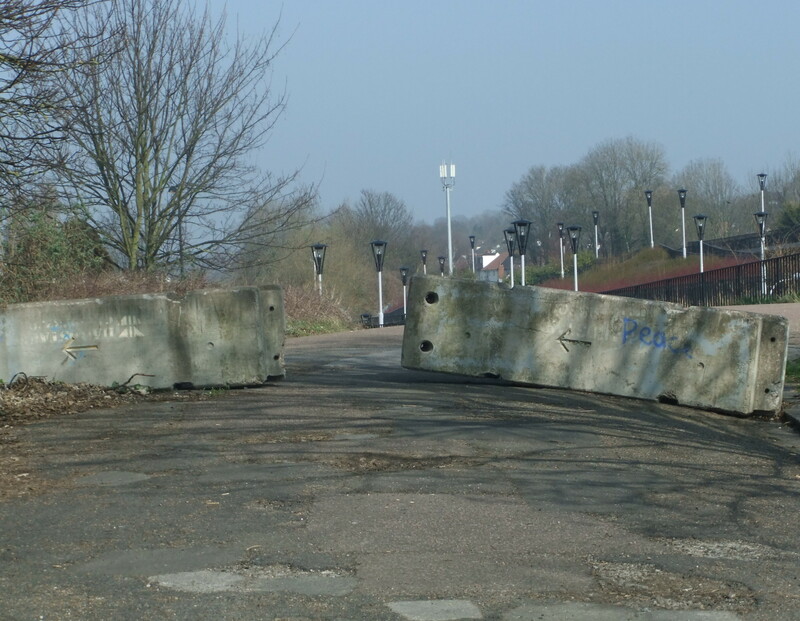 Our route took then took us past some Victorian railway workers’ cottages and on to the remains of the former railway station, with its scenic views of the industrial estate and the bypass. Little now remains of the railway station other than some concrete bollards, one bearing the optimistic graffiti “Peace”. Me getting in some culture at the site of the former cinema. Next, we were in for a refreshing view of the railway bridge, and then the Methodist Church, with its charming concrete car park. We very much enjoyed seeing the site of the former cinema. It is now a tile shop but with a little imagination one could picture the Edwardian picture-goers lining up to see Clark Gable and Jean Harlow and other stars of the silver screen. 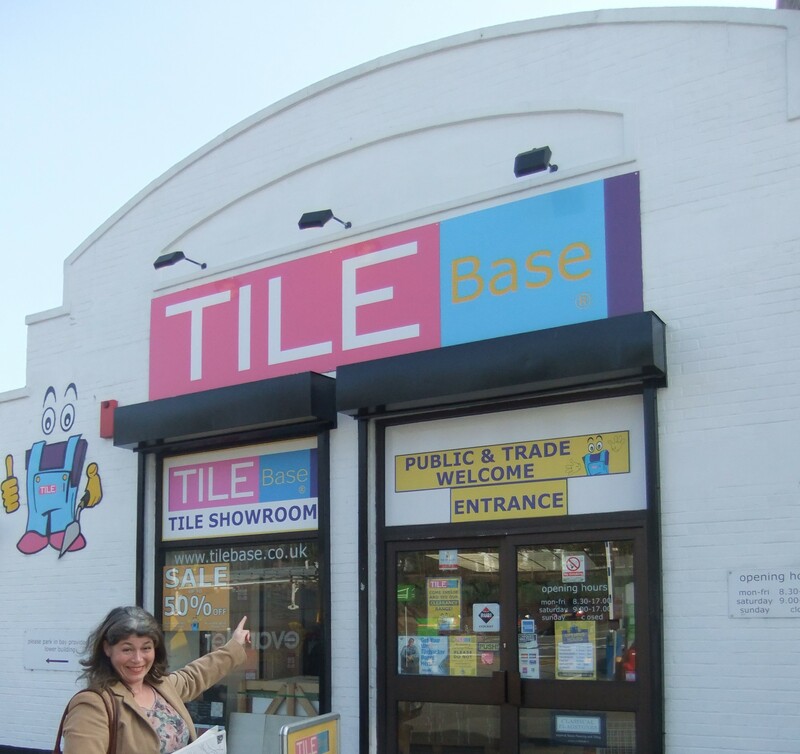 Nowadays, of course, the punters line up to view instead affordable bathroom tiles (“Huge savings to be made! MUST END SOON!”) and cast strange looks at the small band of heritage-seekers milling about taking photos of the shop front. Action Man getting in some education at the Centre for Continued Adult Education and Training. 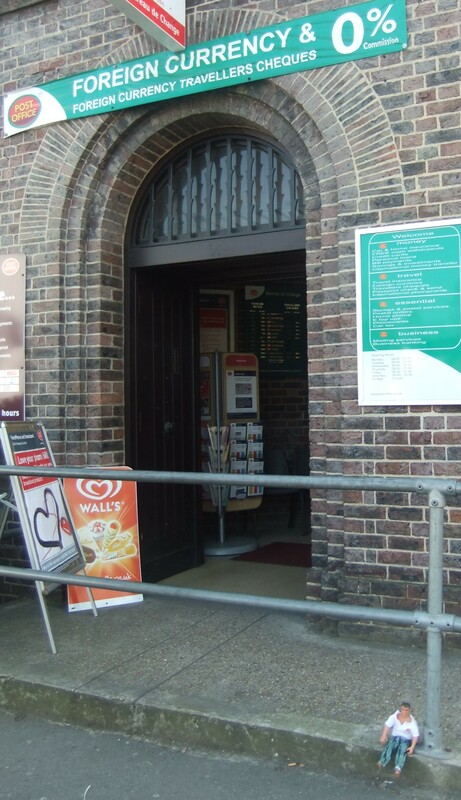 The presence of a Centre for Continued Adult Education and Training, next on the heritage route, put paid to any ideas we might have had that Dulltown is no centre of academia, while the Post Office is billed as one of the town’s “architectural landmarks”. It’s not Ephesus or Rome, or the ancient thermal spa at Bath by any means, but its bleak 1930s brick-built splendour is heritage of a kind, though I did get some funny looks while I was taking its photo. Heritage: the former railway station. The last stop on the trail was the workers’ cottages for the former lunatic asylum. After an invigorating gawp at these, it was time to return to the office. Happily, there is a Heritage Trail Part Two (the route planners didn’t want to pack too much excitement into Part One and considerately left some further attractions for us to visit another time). Just as a teaser, to keep readers returning to my blog, I can reveal that next time we will be seeing, among other sights, the Christian Fellowship Church and the car repair workshop that was once the town forge. now there’s an idea – and of course, caterpillars eventually turn into lovely butterflies. There could be parallels with Dulltown becoming more attractive in my eyes as the sun comes out and the waste land turns into a blossoming butterfly wilderness! Though Action Man is quite nattily turned out in these photos, may I suggest adding a tutu or some such for the church visit? He’d look cute in such garb, I agree. I will keep an eye out for some suitable garments! More of action man please. Here I am, trying to produce highbrow and intellectually thought-provoking work, and all anyone is interested in is silly pictures of a doll. Still, one must tailor one’s output to the audience, and I do have a few Action Man pics up my sleeve – including one of them receiving important results from the VD clinic, which I’ll try and post when I can think of a context for it.